We have design stock of highly reliable popular items. Upper Surface Ground Attachment PG Rollers are ground. The upper surfaces of attachments are ground when present. 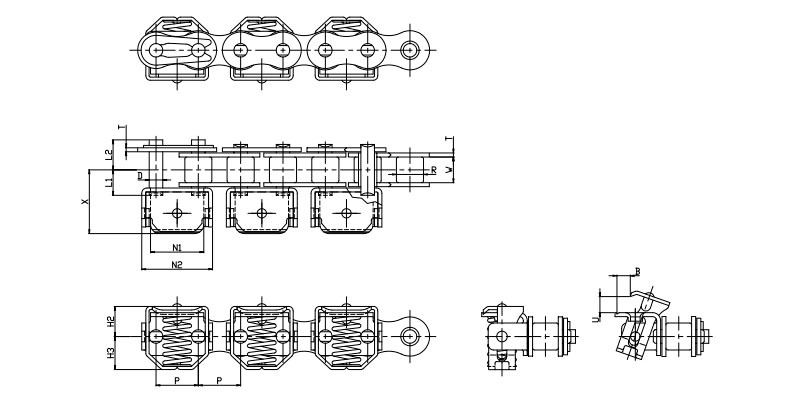 Double Pitch Deep Link Chain DL A Double Pitch Chain with an H1 dimension larger than the roller upper surface. Can directly convey goods, even when using an R-roller. 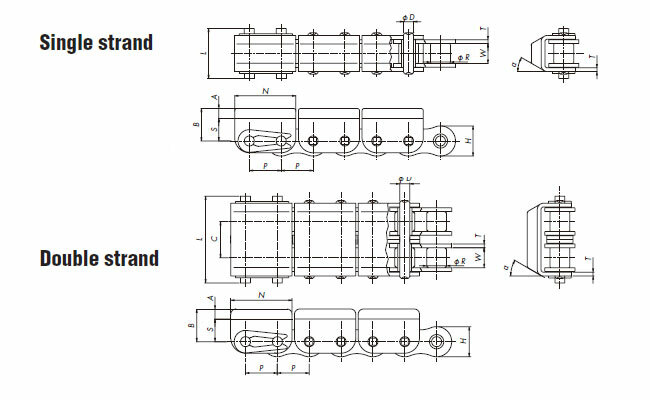 Inward Bending Attachment UM Inward bending attachments allow for items to be directly conveyed or sandwiched and conveyed. The attachment upper surface has been chamfered to prevent damage to conveyed items. 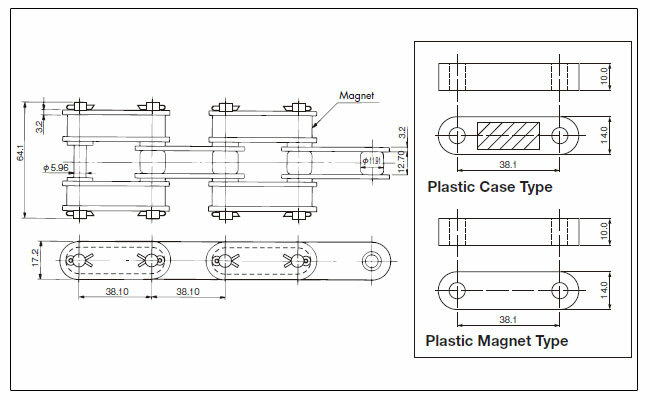 Guide Roller GR Guide rollers are used to prevent meandering and as running rollers. Extended Pin EN The extended pins (hardened steel) have been threaded. Jigs can be attached with a bolt. with Clip EC Jigs can be attached with clips. Stay Pin ST Chains with long pins are in parallel. They are suited to conveying goods atop the pins, or for attaching nets and the like. Cone Attachment RE Ideal for conveying various bar-shaped items. Sticker Attachment FS This conveyor chain is ideal for gripping thin items (film, etc.) using its sharp cone-shaped attachments. Gripper Attachment KU This chain grips conveyed items using a clip. Film gripper chain KUM This chain grips conveyed items using a clip. 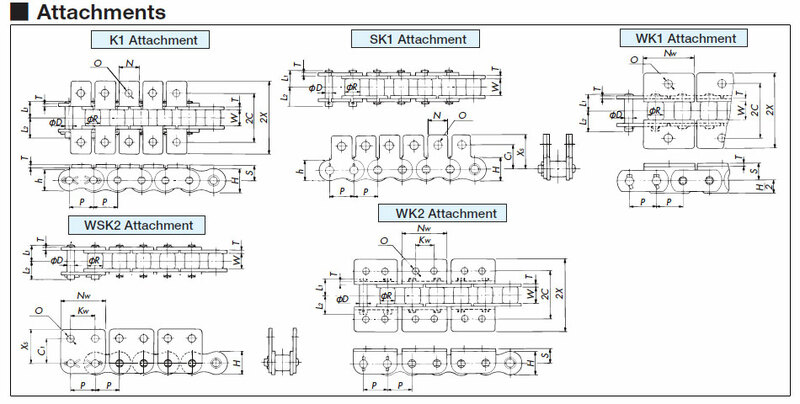 Attachment with Magnet MG Magnets attract conveying cases, allowing for inclined conveyance. Rubber Pad Attachments RSG Rubber pads are baked on. Items can be gripped between the elastic rubber pads and conveyed. Crescent CL For flat, circuitous conveyance. 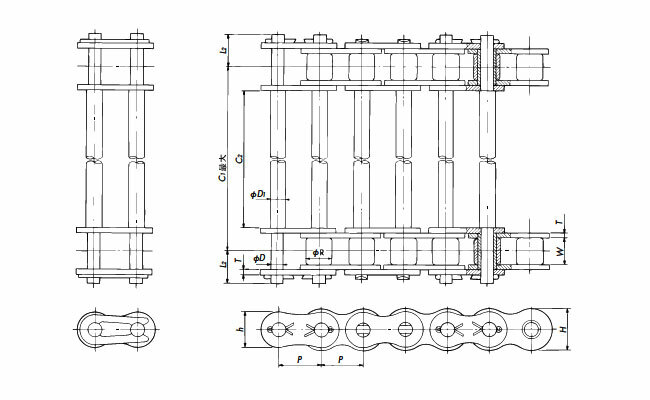 Riveted Slat SLT Chain with slats. Ideal for conveying rather heavy items.